This morning, two loooooong days later, Biden finally issued a statement best characterized as a non-denial denial. In my many years on the campaign trail and in public life, I have offered countless handshakes, hugs, expressions of affection, support and comfort. And not once–never–did I believe I acted inappropriately. If it is suggested I did so, I will listen respectfully. But it was never my intention. 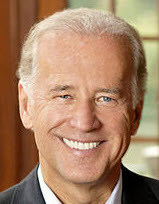 So Biden is now also a nominee for my list. Democratic voters seem to be a little more sensitive on the issue of sexual harassment (see Franken, Al) than Republican voters (see Video, Access Hollywood). So it’s quite possible that Biden, who hasn’t even declared his candidacy, won’t run, and if he does, will lose the nomination to someone else. In which case this will be the only joint appearance of Biden and Trump on a platform. At least in Vegas.